But we were 7 - 0. We were great and lost the last 6 to Michigan, Ohio State, 'bama, Clemson, ND and Stanford. We have dinosaur Strong still calling the shots, so it would not surprise me in the least if we didn't make a bowl. I just cant see us not getting into a bowl game. We played bad in ever game and still made a bowl game last year. Gilbert was the problem. He is out and no way in hell does KB not have immediate success. Im still on a 9-10 win season until I see a reason not 2 believe they can do it. This might be our fastest collective group of recievers yet. I think we win through the air against............. Whisky. GO BOLD . 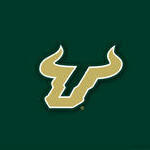 GO BULLS. I don’t know ,it was a missing part of the offense and Bell likes the fun n gun .